Arrived back in Goshen Sunday afternoon. Mom and Dad came over and we got to visit for a couple hours. It is much more miserable here than anywhere we have been due to the humidity. It was a hot nasty drive through Chicago yesterday, but made it without any problems. Heading back to Mooreland today to get the house emptied and up for sale. Going to get started painting the inside. 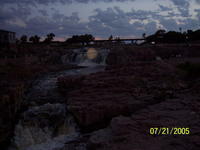 We left Sioux Falls, South Dakota, this morning about 9:00. Drove on I-90 all day and arrived at the Wisconsin Dells tonight in time for supper. We took one detour to go see an RV dealer and that was a waste of time. We just got back from a quick tour of the Dells Broadway and quite frankly, it is a big tourist trap. I would like to ride the boats and see the terrain, but we had not planned on this and are not going to take time to do it now. Everything else is just T-shirt shops, fudge shops, magic shows, haunted houses etc. It’s about like Pigeon Forge. Will be leaving tomorrow morning some time and getting back to Elkhart as we have to pick up the car we left there. Met a nice Westie tonight from Canada. He made friends with Bailey and Neal. Also met a nice Airdale . . . a rescue also. Till next time. . . .
We are in Sioux Falls, South Dakota! We left Kansas City, Missouri, Wednesday after getting the motorhome back. It actually was about 4:30 when we left, but the motorhome cab air conditioning was still not working. Since we had stayed there an extra day and waited until late to get it back, it was a real disappointment that it wasn't working. But the fuel pump was fixed, so we took off. Planned to get somewhere down the road, but I was thoroughly pumped. Terry was too stressed to drive, so I got behind the wheel and didn't crawl out from under it until midnight in Sioux Falls. We are in Tower Campground, having called ahead to get a good spot. It is quite comfortable in our campsite, dogs are happy, and we are enjoying the town. Actually, yesterday we became South Dakota residents. Yayaya! Another step toward full-timing completed. We got the tags for our vehicles and got our full-timer's insurance. Everything seems to be falling into place. This really is a nice town and we decided to stay today and do some sightseeing. We went down to the Falls Park (Sioux Falls is actually named after the Falls on the Big Sioux River) and watched a laser and light show last night which told a history of the city and area surrounding it. Quite interesting and entertaining as well. So, all is well and we are enjoying our trip, finally. . . Dogs are doing fine. Neal had a seizure Monday night, but just one and we got it stopped with ice and some Bach's Rescue Remedy. He seemed to have less trouble coming out of this one. We did visit a dog park last night to see if we want to take them there, but it wasn't too regulated. There were a lot of big dogs, and that would cause problems for Bailey. You know, Bailey is a Scottie who thinks he is a Rottweiler. Hah. Did forget to mention that in Kansas City, while trying to find something "cool" to do with the dogs in tow, we found the Hunt Subtropolis. It is underground storage which uses the still operating limestone mine. They have paved and built basically an underground business complex in the mine. It was so fascinating. It was cool and well lit. Semi-truck/trailers were running in and out delivering their loads and there are trains which go in/out as well. They give you a map because you can get lost, but we didn't have any trouble. People work down in the businesses and there are many parking lots. You can see business fronts, but we didn't get to go in. We did go to the visitor's center "down under." Take care. . . till next time. We left Branson this morning. Got about 100 miles up the road toward Kansas City, Missouri, and the fuel filter clogged again. We were in Carthage, Missouri, so found a good place to stop and change the filter. Drove on up 71 only to have more problems about 45 miles further. Terry has decided that the problem is now the fuel pump, not the fuel filters we have been changing. It does help to change the fuel filters, but he thinks it is because it cools down when we are changing the filter. We drove another 3 miles or so and are in a campground north of Rock Hill, Missouri. Since it is Sunday, we didn’t want to take a chance on getting a tow. 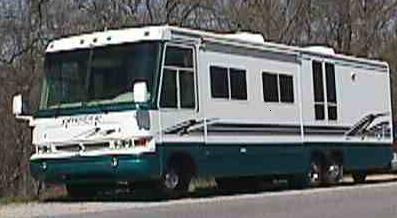 We really think that tomorrow we will be able to drive it perhaps into Kansas City where there is an RV Service Center. If not, we should at least get a little further and Good Sam can take it from there. Just worried about getting it fixed in a timely manner. If we don’t, we will probably head home and try to get to South Dakota later in the summer. Well, we arrived in Branson on Thursday. We are in the ABC Campground. We weren't the first RV.net people here, so we immediately found people to talk to. Met a lot of new members of the forum and revisited old friends as well. Had a "gathering" the first day in order to welcome everyone and pass out "goodie" bags. We did some sightseeing while we were here and road the "Ducks," the amphibious thing-ies and go on the land and the water. We went into the water with a hugh splash and drove out around an island on Table Rock Lake. Would certainly like to have had the boat here and did a little traveling on the lake. The lake is 90 miles long. Could certainly have some fun there I am sure. We've met a lot of nice people, including a few teachers, one retired, one not. The people next to us have full timed for 8 years and I think are about the same age as us. It has been very very hot and humid here. It is very uncomfortable outside. Today several campers registered 101 degrees at their site. It wasn't as humid today as yesterday, however, and I thought it felt cooler. We have all decided that Branson is NOT the place to be in July. This is the second time we have been here in July and it was hot then as well. We have been out to eat a couple times with friends, but didn't go see any shows. Shame on us. I cannot believe how large Branson has grown since we first came here about 11 years ago. Back then there was only 1 thoroughfare through the town. We are leaving in the morning for South Dakota to become residents of that great state. I'm sure we won't be there tomorrow. It will take at least another day of traveling as well. Well, we finally got going Tuesday, July 12. Picked up the motorhome in the morning, waiting about 1 1/2 hours to get the paperwork completed, and then brought it back to pack. While we were packing, the refrigerator quit working (the subject of the past 8 days in the shop, so we finished packing it, called the shop, and took it back in. Finally at about 4:30 we were on our way. We drove to Remington, Indiana, and stayed in a very nice campground there just off the interstate. It was the Caboose Lake campground, or something like that. Today we drove, and drove, and drove. About 8 hours total. Really did not have to do that much, but we both felt like it and were pretty pumped up for the Branson rally. We pulled into a rest area about 3:00 and Terry changed the fuel filter again. We had a problem with the fuel filter weeks ago, changed it, and drove about another 500 miles before it started clogging again. This time it went about 1,000 miles before needing changing. So it definitely is getting better and we hope it is filtering out whatever caused the original problem. Don't want to think about dropping the gas tank on the Damon. I sure am glad he decided to change it when he did as it was my turn to drive and we were in the hills. A clogged fuel filter is no fun in the hills and would have found us off to the side on the interstate. We drove on to Waynesville, Missouri, about 100 miles from Branson. Decided to quit about 5:00. It was a long day of driving and we will have a short 2+ hours tomorrow. Our site for tomorrow is already waiting on us, reserved and paid for, so we don't have to be in a hurry. Don't know if we will take in any shows. Do plan to ride the "Ducks" on Table Rock Lake, the amphibious tank/boats. We have a cookout for Friday put on by the campground and a pitch on Saturday. Sunday then we leave for South Dakota. Well, it always happens, doesn't it. Motorhome goes in Monday. Supposed to be done Tuesday. Didn't get started until Tuesday, so done Wednesday. Yeh, right. But the good news is that it will be done today. . . Friday. Seems that when they changed out the cooling unit on the refrigerator (under recall from Norcold), there was another problem once they got it all back in. Now the other problem is one we had experienced, but would usually get it working. Turns out it was a bad brain board and in the 4-door refrigerator, it is a $500 part. Ouch! Good news is that extended warranty continues to be worth it's weight in gold, so a $50 deductible later, we have a new board. We are still hanging around up here at the house in northern Indiana. Could have gotten more done at the house down south we are trying to get ready to sell, but one thing retirees have is time, right? So we have been running errands getting stuff for the apartments, car shopping, etc. We are still in the process of sorting through all of our "junk" and trying to get rid of just about everything. It's been a long, slow process and we will be glad when it is done. The house is almost cleaned out. We have a couple old cars that will go up for auction on ebay. We are selling some heavy items, tools, household, and an old boat at an auction in a couple weeks. The motorhome goes in tomorrow for a refrigerator overhaul. Actually it was recalled, so we don't have to pay for it. Yay! I am busy trying to remake the front curtains as the old ones are falling apart. Next Monday we leave for an RV.net rally in Branson, Missouri. We don't plan on going to any shows, but will visit with friends.